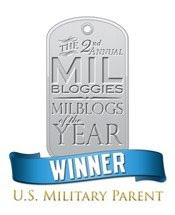 color: SOME SOLDIER'S MOM: 2006 Milbloggies Announced! My sincerest thanks to all who voted for my blog... I am truly honored to be in such great company! 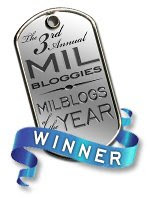 See everyone at the Milblogging Conference in May... registration will be open soon -- so keep watching for the announcement!! TOMORROW -- THAT'S FRIDAY, MARCH 2nd -- CONSTITUTIONAL PUBLIC RADIO WILL INTERVIEW HISTORY WITH TWO AMERICAN HEROES. HELP GET THE WORD OUT! AND PLEASE BE SURE TO TUNE IN. CONSTITUTIONAL PUBLIC RADIO - "CPR FOR THE HEART OF AMERICA"
I just read about this on the Angels board so I scooted over here to stay congrats! I've been reading you for a while now....you represent all military moms very proudly and nobly. (That doesn't look right, LOL...is "nobly" a word?) Anyway, way to go!